Technology is on a continuous innovative role and with that viewpoint has brought a considerable change in our lives. With better means of access, connectivity has enhanced a lot better; credit even goes to the smart devices, sensors, wireless communication and IoT app development companies. Internet of Things (IoT) platform has already built a buzzword and its demand by gradually empowering the organizations to sort out and handle their operations opportunely. This enables them to undertake complex projects and deal with them smartly. The IoT services are transforming mobile app development trends today and also in the years to come. These services are reaching to top-notch control that can handle everything right from an assortment of unified events to some interconnected devices. As per BI Intelligence, twenty-four billion devices will get linked to IoT by the year 2020, whereas $6 trillion is likely to be invested in IoT within the next five years. Internet of Things has significantly influenced a diverse set of businesses and industries which includes medical sector, the entertainment market, gaming, retail, supply chain management, automotive, home automation, logistics and agriculture domains. So, there shouldn’t remain the smallest amount of doubt to IoT app development companies concerning its bright future. Today Internet of Things does not have restricted services, but its overall scope has been much broadened and become comprehensive. So, it is vital to think about the industry and study it hard. Also, the industries are linked to the devices and network to build solutions. As such there are a varied set of industries that is precisely associated with other entities such as the medical, transportation, entertainment, sports, retail, and manufacturing. For example, it will become more comfortable for the ordinary people to connect with medical services and find ways to save time as well as efforts. As the fitness aspects interrelated to health insurance, doctor appointments, medical care devices, coupled networks and other things correlated to a particular industry will be connected firmly. Why iOS Application Development is in High Demand? The primary and foremost step that the developer requires to make sure is picking the most fitting platform for the development procedure. You must keep in mind the piece of information that it should support the futuristic IoT applications and its changing elements. The platforms like Xively, Ubidots, and Thingworx are IoT proven and offer the best scope to build the most elegant apps. Apart from that if you are selecting an authentic platform; you are also keeping away from the excessive exposures. With the help of these platforms, you don’t have to commence anything from scratch. Indulging in the different levels of IoT applications is crucial as it gives an idea to know the networks, systems and the functioning of the devices. There are four different levels, or we can also describe it as layers which comprise the devices utilized, the ingestion tier, the data analytics and the end-user interface. So, first chew over the devices that you will be linking to the defined ingestion tier and the overall infrastructure. Also, consider how the software will receive data and organize the needed information. In the 3rd layer, the data is mostly explored with a different course of actions with the assistance of analytics tools. The last but not the least is the end user interface to the users for whom the application is getting built up. Handling your IoT applications well will assist to offer better business and technology opportunities. Like, while IoT app development companies are creating the apps, it becomes imperative to set apart services from API Interface. By doing this, you are enabling your app to run on both mobile and web desktop effortlessly. It becomes the sheer accountability of the IoT app developer to enable and empower the app owner to have robust, secure environment for data and information. The security aspects become dominant especially in the case of managing GPS networks or in case of financial apps and transaction-related domains. This also covers the physical attacks. IoT is all the time linked to things and continuously communicates with them. This is what makes their distinction from the conventional web and mobile apps. The hardware is always held to have security based problems in the firmware, and so it becomes necessary to keep on updating it. The firmware requires being authentic and secure before releasing things. As a mobile app developer, it is required to keep in mind when building apps for the IoT technology that cannot comprise with the quality and speed. You need to be spot on with changes in the ideas into reality and provide an efficient prototype. After achieving which you can think further. The Internet of Things based applications should be robust and highly scalable. The IoT concepts are changing very fast having vast potential and will become outsized than ever by the time one will reach its destination. Robustness and scalability will allow your app to remain consistent and upgradable even after an extended period. The Internet of Things (IoT) is now not new to the technological or industrial space. It is intensifying and is reaching out to a different height where access to analytical insights and getting closely connected has become swift, trouble-free, effective and affordable. 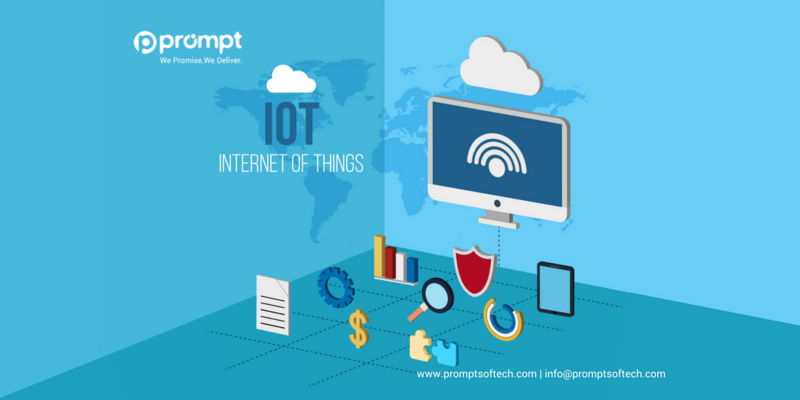 The IoT services at Prompt Softech grasp the potential to boost the proficiency of its clients. It has successfully improved the productivity of dedicated companies and professionals by delivering IoT based applications working with a group of platforms, solutions, and technologies.